Lucien Bonaparte, Prince Français, 1st Prince of Canino and Musignano (born Luciano Buonaparte; 21 May 1775 – 29 June 1840), the third surviving son of Carlo Bonaparte and his wife Letizia Ramolino, was a French statesman, who served as the final President of the Council of Five Hundred at the end of the French Revolution. Lucien was a younger brother of Joseph and Napoleon Bonaparte, and an older brother of Elisa, Louis, Pauline, Caroline and Jérôme Bonaparte. Lucien held genuinely revolutionary views, which led to an often abrasive relationship with his brother Napoleon, who seized control of the French government in 1799, when Lucien was 24. Lucien Bonaparte's rise during the French Revolution, unlike Napoleon Bonaparte's other siblings, was not based on familial connections or nepotism. This was one of the issues that caused friction between Lucien and Napoleon in the early years of the 19th century, as their political differences deepened. Both Lucien and Napoleon had a very keen interest in historical antiquity as youngsters. Lucien was born in Ajaccio, Corsica in 1775, and was educated in mainland France, at the College d'Autun, the military school in Brienne, and at seminary in Aix-en-Provence. In 1769 the Corsican Republic had been conquered by French forces and annexed into France. 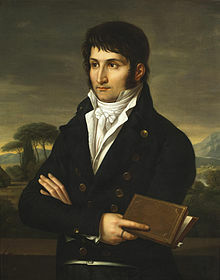 Lucien's father Carlo Bonaparte had been a strong supporter of Corsican patriots under Pasquale Paoli, but later switched to become a supporter of French rule. A 14-year-old Lucien returned to Corsica at the outbreak of the French Revolution in 1789 and became an outspoken speaker in the Jacobin Club at Ajaccio, where he renamed himself "Brutus". An ally of Maximilien Robespierre before and during the Reign of Terror, he was briefly imprisoned (at Aix-en-Provence) after the coup of 9 Thermidor on 27 July 1794, which deposed Robespierre and led to Robespierre's execution the following day. As president of the Council of Five Hundred — which he removed to the suburban security of Saint-Cloud — Lucien Bonaparte was crucial with a combination of bravado and disinformation to the coup d'état of 18 Brumaire (date based on the French Revolutionary Calendar) in which Napoleon Bonaparte overthrew the government of the Directory to replace it by the Consulate on 9 November 1799. Lucien mounted a horse and galvanized the grenadiers by pointing a sword at his brother and swearing to run him through if he ever betrayed the principles of Liberté, égalité, fraternité. The following day Lucien arranged for Napoleon's formal election as First Consul. Napoleon made him Minister of the Interior under the Consulate, which enabled Lucien to falsify the results of the plebiscite but which brought him into competition with Joseph Fouché, the chief of police, who showed Napoleon a subversive pamphlet that was probably written by Lucien, and effected a breach between the brothers. Lucien was sent as ambassador to the court of Charles IV of Spain, (November, 1800), where his diplomatic talents won over the Bourbon royal family and, perhaps as importantly, the minister Manuel de Godoy. Though he was a member of the Tribunat in 1802 and was made a senator of the First French Empire, Lucien came to oppose many of Napoleon's ideas. In 1804, with Lucien disliking Napoleon's intention to declare himself as Emperor of the French and to marry Lucien off to a Bourbon Spanish princess, the Queen of Etruria, Lucien spurned all imperial honours and went into self-imposed exile, living initially in Rome, where he bought the Villa Rufinella in Frascati. Portrait by Robert Lefèvre in the Palace of Versailles. In 1809, Napoleon increased pressure on Lucien to divorce his wife and return to France, even having their mother write a letter encouraging him to abandon her and return. With the whole of the Papal States annexed to France and the Pope imprisoned, Lucien was a virtual prisoner in his Italian estates, requiring permission of the Military Governor to venture off his property. He attempted to sail to the United States to escape his situation but was captured by the British. When he disembarked in Britain, he was greeted with cheers and applause by the crowd, many of whom saw him as anti-Napoleon. The government permitted Lucien to settle comfortably with his family at Ludlow, and later at Thorngrove House in Grimley, Worcestershire, where he worked on a heroic poem on Charlemagne. Napoleon, believing Lucien had deliberately gone to Britain and thus a traitor, had Lucien omitted from the Imperial almanacs of the Bonapartes from 1811 until his 1814 abdication. Lucien returned to France following his brother's abdication in April 1814. Lucien continued to Rome where on 18 August 1814 he was made Prince of Canino, Count of Apollino, and Lord of Nemori by Pope Pius VII and Prince of Musignano on 21 March 1824 by Pope Leo XII. In the Hundred Days after Napoleon's return to France from exile in Elba, Lucien rallied to his brother's cause, and they joined forces once again during Napoleon's brief return to power. His brother made him a French Prince and included his children into the Imperial Family, but this was not recognized by the Bourbons after Napoleon's second abdication. Subsequently, Lucien was proscribed at the Restoration and deprived of his fauteuil at the Académie française. In 1836 he wrote his Mémoires. He died in Viterbo, Italy, on 29 June 1840, of stomach cancer, the same disease that claimed his father, his sister Pauline and his brother Napoleon. Lucien Bonaparte was the inspiration behind the Napoleonic reconstitution of the dispersed Académie française in 1803, where he took a seat. He collected paintings in la maison de campagne at Brienne, was a member of Jeanne Françoise Julie Adélaïde Récamier's salon and wrote a novel, La Tribu indienne. He was an amateur archeologist, establishing excavations at his property in Frascati which produced a complete statue of Tiberius, and at Musignano which rendered a bust of Juno. Bonaparte owned a parcel which had once formed part of Cicero's estate called Tusculum, and was much given to commenting on the fact. In 1825, Bonaparte excavated the so-called Tusculum portrait of Julius Caesar at the Tusculum's forum. Filistine Charlotte (28 November 1795 – 6 May 1865), married Prince Mario Gabrielli. Stillborn son (13 March 1796). Victoire Gertrude (born and died 9 July 1797). Christine Egypte (18 October 1798 – 1847), married firstly Count Arvid Posse (divorced) and secondly Lord Dudley Stuart. Charles Lucien Bonaparte (24 May 1803 – 29 July 1857), the naturalist and ornithologist. Letizia (1 December 1804 – 15 March 1871), married Sir Thomas Wyse. Joseph (14 June 1806 – 15 August 1807). Jeanne (22 July 1807 – 22 September 1829), married Marquis Honoré Honorati. Paul Marie (3 November 1809 – 7 September 1827). Louis Lucien (4 January 1813 – 3 November 1891). A philologist and politician, expert on the Basque language. Pierre Napoleon (11 October 1815 – 7 April 1881). Antoine (31 October 1816 – 28 March 1877), married Marie-Anne Cardinali, without issue. Marie Alexandrine (10 October 1818 – 20 August 1874), married Vincenzo Valentini, Count di Laviano. Constance (30 January 1823 – 5 September 1876), a nun. ^ a b Schom, Alan, Napoleon Bonaparte, (HarperCollins Publishers, 1997), pp 237, 238. ^ a b Stroud, Patricia Tyson, The Emperor of Nature: Charles-Lucien Bonaparte and his world, (University of Pennsylvania Press, 2000), pp.21; 160. ^ The J. Paul Getty Museum (1987). Ancient Portraits in the J. Paul Getty Museum: Volume 1. Getty Publications. p. 24. ISBN 0892360712. ^ de Bourrienne, Louis Antoine Fauvelet and Ramsay Weston Phipps, Memoirs of Napoleon Bonaparte, Vol.1, (Charles Scribner's Sons:New York, 1895), 100. ^ Atteridge, Andrew Hilliard and Jérôme Bonaparte, Napoleon's brothers, (Methuen and Co.:London, 1909), 98. Wikimedia Commons has media related to Lucien Bonaparte.